play on the characters and situations of classic-era animation. It wasn't long before his production company, Amblin Entertainment, was working with Warner Bros. on Tiny Toon Adventures. The basic premise was, the old-time Looney Tunes characters have retired from show business and are now teaching their skills to younger would-be entertainers. Bugs Bunny, Daffy Duck, Porky Pig and a host of less stellar players are instructors at Acme Looniversity, where students as young as American middle-school kids (12-14) learn the fine arts of stretching, squashing, and getting hit on the head by falling anvils. But the old guys weren't stars of the show — in fact, most of their irregular appearances were mere cameos. 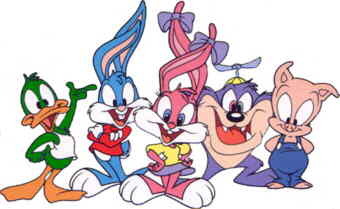 Each had a counterpart among the new generation, which included Babs & Buster Bunny, Plucky Duck and Hamton Pig — not exact duplicates of Bugs, Daffy and Porky, but usually close enough to see some resemblance (tho in some cases, such as Elmyra Duff (counterpart of Elmer Fudd) and Montana Max (Yosemite Sam), you had to look pretty close). Other cast members included Fifi (Pepe LePew), Sweetie (Tweety Bird), Concord Condor (Beaky Buzzard), Furrball (Sylvester Pussycat), Calamity Coyote (Wile E. Coyote), Little Beeper (Road Runner), Dizzy Devil (Tasmanian Devil) and Gogo Dodo (Porky's antagonist in Bob Clampett's Porky in Wackyland). The way this was explained was, each of the younger toons had chosen a special favorite teacher, mentor and role model, hence the resemblance. In reality, of course, it was simply an attempt to trade on the marketing power of the old ones. Each of the new guys was about as prominent in the show as his counterpart had been before — nobody appeared in all 130 episodes, tho, and producers mixed and matched them to make sure everybody got exposure. Steven Spielberg Presents Tiny Toon Adventures (the official title, tho nobody actually used the first three words) hit the air September 14, 1990, as a syndicated half-hour cartoon show. A year later it was picked up by Fox TV. Voices included, but were far from limited to, Joe Alaskey (Baby Huey, Duckman's father, Grandpa Lou on Rugrats and more) as Plucky, Don Messick (Scooby-Doo, Atom Ant and The Jetsons' dog, Astro) as Hamton, and Rob Paulsen (Yakko Warner in Animaniacs, Gladstone Gander in DuckTales, and over a dozen voices in Chip'n'Dale's Rescue Rangers) as various incidental characters. Plucky was the only one ever to get his own show, and that one consisted of reruns of old Tiny Toon Adventures. Elmyra later got a starring, tho rather incongruous role in the final season of Pinky & the Brain. There have been no Tiny Toons comic books in the U.S., tho DC Comics has packaged quite a few for overseas publication. A full-length movie version titled How I Spent My Vacation, originally intended for theatrical release, came out on home video on March 11, 1992. Their Christmas special, It's a Wonderful Tiny Toons Christmas Special, aired in 1992 and their Halloween special, Night Ghoulery, in '95. After all the episodes had been seen on Fox at least a couple of times, it was rerun on Nickelodeon, where Ren & Stimpy, Hey Arnold!, The Wild Thornberrys and many other 1990s and 21st century cartoon series got their start. Later, it was picked up by the WB TV network. Tiny Toon Adventures can currently be seen on Nickelodeon again. Text ©2002-05 Donald D. Markstein. Art © Warner Bros.